The Definitive Mystery In The Air [Summer 1945] Radio Log with Jackson Beck and Ernest Chappell. Camel's 1945 summer replacement for their wildly successful Abbott and Costello program was an interesting take on the detective mysteries of the era. Mystery . . . In the Air! was a fascinating combination of military intelligence exploits mixed with a legal backdrop and conventional crime detection. The focus of the series was an ex-M.I.S. G-2 officer, Lieutenant Colonel Stonewall 'Stoney' Scott, portrayed by Jackson Beck. Successful young Attorney Stoney Scott had been practicing law in his dad's firm before going off to war. Upon Stoney's return to civilian life--and his dad's law practice--he teams up with another ex-comrade in arms--and G-2 investigator--'Tex' Burnet, portrayed by Geoffrey Bryant. The two of them undertake thirteen mysteries with a common, underlying military theme of one type or another. Their investigations eventually involve ex-Marines, dogfaces, WACs, merchant seamen, international conspiracies, as well as a smattering of domestic crimes, murders and mayhem. Very much a cross-over type of mystery, the plots tended to be both twisty and cleverly resolved. Indeed, Jackson Beck's portrayal of Stoney Scott unquestionably informed his following performances as Philo Vance from the summer of 1948 to the summer of 1950. Jackson Beck's stentorian voice leant the perfect gravitas to his protagonist. Offset by 'Tex' Burnet's twangy drawl, the two were well suited as detective and sidekick, and their G-2 background resurfaced again and again throughout the series. The interactions between them were more in the vein of consultative as opposed to the 'sidekick as lackey' paradigm so often heard over radio in the detective genre of the era. In keeping with Camel's long-standing efforts to send free cigarettes to the men overseas, Jackson Beck would 'step out of character' at the end of each program to honor a particularly heroic member of the military--The Yank of The Week--and their actions. This would be followed by the Camel spokesman making an award of cartons of cigarettes to a particular branch of the service. A New York production, the supporting cast was assembled from the very finest east coast talent then available: Jane Cowl, Frank Lovejoy, Bernard Lenrow, Edgar Stehli, Jack McBryde, Donald Randolph, Jim Boles, Arlene Francis, Luis Van Rooten, Roger De Koven, June Havoc, Santos Ortega, Owen Jordan, Parker Fennelly, Joseph Curtin, Peggy Conklin, Ed Jerome, Paul McGrath, Ted De Corsia and Margo, among them. Ken MacGregor directed the series with writing by Stewart Sterling and Robert Newman. Ernest Chappell announced the series and William Verdier, later of fame for the FEN-produced Macabre series from the AFRTS, provided the sound effects for the series. Run Dates(s)/ Time(s): 45-07-05 to 45-09-27; NBC; Thirteen, 30-Minute programs; Thursdays, 10:00 p.m. The 1945 Mystery In The Air, summer replacement for Abbott and Costello; a detective mystery format, featuring Jackson Beck as Detective Stonewall Scott. The 1947 Mystery In The Air, summer replacement for Abbott and Costello; an adventure/thriller format tailored for Peter Lorre. 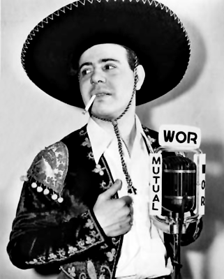 Camel's summer replacement for Abbott and Costello for the Summer of 1946 was a variety format, The Vaughn Monroe Summer Show. With all but one script from the series in wide circulation, there's no excuse whatsoever for mischaracterizing or misinterpreting the production or its details. Stephen Courtleigh, while a moderately successful Television performer and writer, was never the star of Mystery . . . In the Air!. The star for all thirteen installments was Jackson Beck. The mistake in citing Stephen Courtleigh as the star apparently arose from several newspaper listings inaccurately attributing the starring role to Courtleigh instead of to Jackson Beck. Stephen Courtleigh appeared in only three episodes of Mystery . . . In The Air! : Episode #2, The Case of The Angry Ranger and Episodes 7 and 11 in minor roles. Episode #6, while teased as The Case Of the Frightened Friend was retitled--and announced--as The Case of The Worried WAC, and ultimately aired as such, guest-starring Margo. Episode #10 was The Affair of the Reluctant Lady, not The Case of The Reluctant Lady. Each of the above inaccuracies could have been resolved very easily by either listening to the one, surviving episode, or reading any of the twelve surviving scripts in wide circulation. How any of these inaccuracies qualifes the OTRR, OTRRpedia, or the OTTER log as 'most accurate otr database in the world,' remains a mystery to us. 45-07-05 - Lowell Sun - "MYSTERY IN THE AIR," new series: "Case of the Hungry Corpse." WBZ, 10. 45-07-05 The Daily Mail - NBC 10 Mystery in the Air, detective series to run 13 weeks in the Abbott and Costello spot. NBC 10 Mystery in the air, detective series with the lead by Stephen Courtleigh, recently honorably discharged from the Marines, to run 13 weeks in the Abbott and Costello Spot. 9 p.m.--Mystery In the Air (WIBA): "The Case of the Angry Ranger," with Stephen Courtleigh, Joan Vitez. 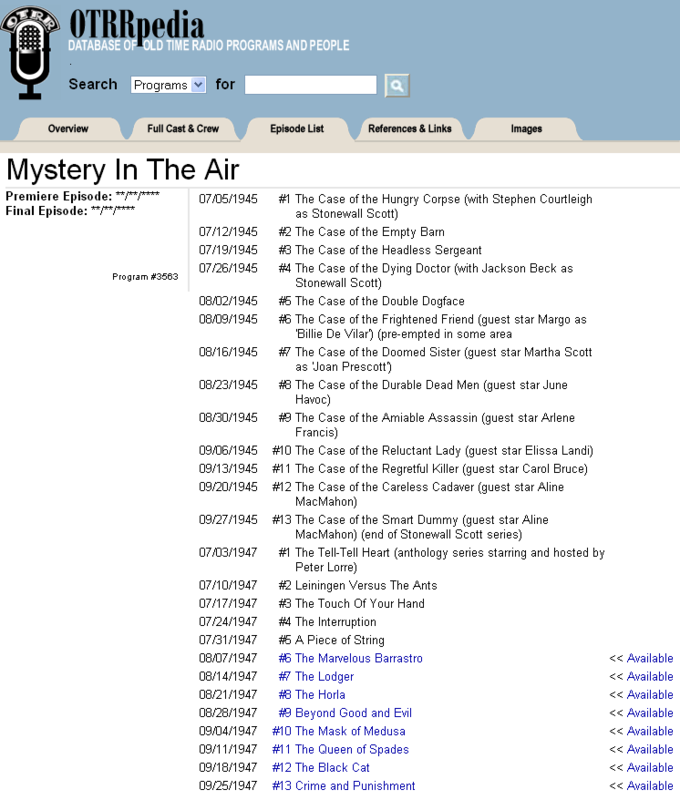 9 p.m.--Mystery In the Air (WIBA): "The Case of the Headless Corporal." 9 p.m.--Mystery In the Air (WIBA): "The Case of the Dying Doctor." 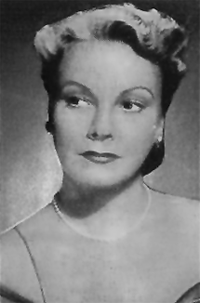 9 p.m.--Mystery In the Air (WIBA): Mitzi Green in "The Case of the Double Dogface." 9:00 NBC Mystery In the Air. Martha Scott will be guest leading lady for Jackson Beck on Mystery in the Air over NBC Thursday night. 9 p.m.--Mystery In the Air (WIBA): "The Case of the Doomed Sisters." The musical comedy star June Havoc will turn dramatic as guest leading lady on Mystery In the Air which stars Jackson Beck as Stonewall Scott over NBC Thursday. 9 p.m.--Mystery In the Air (WIBA): "The Case of the Durable Deadman," with June Havoc as guest star. 9 p.m.--Mystery In the Air (WIBA): "The Case Of the Amiable Assassin," starring Jackson Beck and Arlene Francis. 9 p.m.--Mystery In the Air (WIBA): "The Case of the Reluctant Lady," starring Elissa Landi and Jackson Beck. 9 p.m.--Mystery In the Air (WIBA): "The Case of the Regretful Killer," starring Jackson Beck. Guest, Carol Bruce. 9 p.m.--Mystery Of the Air (WIBA): "The Case of the Careless Cadavor. 9 p.m.--Mystery In the Air (WIBA): "The Case of the Smart Dummy," with Jane Cowl. 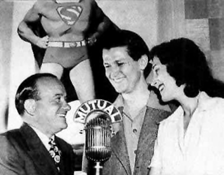 Jackson Beck with long-standing fellow actors Bud Collyer and Joan Alexander, for WOR-Mutual's 'Superman' radio program. 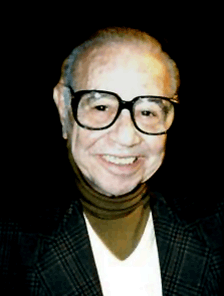 Birthplace: Syracuse, New York, U.S.A.
1942 Are You A Geniuis? 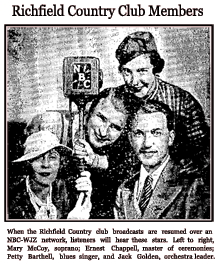 1933 announcement of resumption of The Richfield Country Club over NBC/WJZ, with Ernest Chappell as emcee. Quietly Yours . . .
6'3" Ernest Chappell, born and raised in Syracuse, New York was literally and figuratively, Syracuse's fair-haired boy. Star athlete in high school and Syracuse University, local sportscaster, graduate of Syracuse University, local D.J. and emcee, Radio Director of local Syracuse station WFBL [''First Broadcast License''], and local columnist for the Syracuse Herald with his own byline, Riding The Waves with Chap. Universally well liked and admired, for Chappell, Radio was his oyster for 50 years throughout The Golden Age of Radio. One of radio's pioneers was in Denton this week for a visit with Mr. and Mrs. Eugene Conley, 108 Forest St.
Ernest Chappell, voice of the American Tobacco Co. on radio and television for more than 20 years stopped in Denton en route home from a 10,000-mile business - vacation trip. Accompanying him were his wife, Margie, and their two children, Susie and Jimmy. Chappell began in radio 42 years ago, when the industry was an infant of 15 years. In the past, his fame spread to the extent that he received mail in New York City, addressed simply, "Chappy." Now, he's preparing for semi-retirement from that field, only to embark upon new career. Chappell said, "I'm not interested in making a pile of money now--I don't need that. But what I am interested in is doing something about this country's sense of values." He plans, with other backers, to found a non-sectarian college in Palm Beach, Fla., and eventually to add it to a school of engineering for radio and television aspirants. Also included in Chappell's future plans is ownership of management of a television station. He'd like to work with Dr. Tom Moody, president of the Southern Baptist Pastors Association, in founding a new method for aiding in the spiritual development of the young people of America. The method he has outlined would begin daily telecasts in the morning with a "thought for the day." Noon programs would be designed to help viewers develop the habit of meditation. And final moments of daily telecasting time would be a presentation of a hymn by such artists as Kate Smith and "Tennessee" Ernie Ford. But looking ahead to a new field occupies only a portion of Chappell's time--he also recalls stories about some of the big-name stars with whom he's worked during the past 42 years. Rudy Vallee was one. 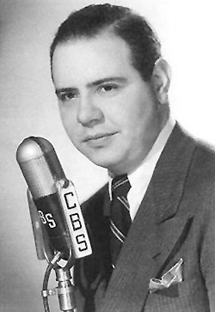 And there was Orson Welles on CBS' "Hello, Americans," and David Ross and Edward R. Murrow. And a list too long to complete. And, of course, North Texas State University artist-in-residence Eugene Conley. Conley and Chappell met "back in '35 or '36" when the future Metropolitan opera star was still singing in church choirs. Chappell was in Boston to hear auditions for one of his radio programs. He heard Conley sing, and sent him on to New York City. They've been fast friends ever since, even though Conley and his wife eventually came to Texas and NTSU. When Chappell became an independent contractor in 1932, he was asked to cast a program for Herbert Diamond Co. of New York. It became the Herbert Diamond Entertainers, with Vallee singing two numbers. A dance band played and guest artists appeared regularly. "I thought the show was going along fine," Chappell recalls. "The firm was selling it's merchandise and they liked the show. "Then one day the manager called me into his office and said, "Look here at this stack of letters." "All of them were protesting against presenting dance music on Sunday afternoon. So the show--and Vallee--had to go. "Later I put him in another show on Thursday nights, and that was okay. But not on Sunday, no matter how popular he was."